Massive power and extensive tone-shaping in a lightweight head. The Michael Anthony VB-MA signature tube-powered bass amplifier is a 300-Watt all-tube head that packs a low-end punch, while weighing in at an extremely portable 38 lbs. Anthony comments, "Having road tested the Peavey VB-3 around the world with Chickenfoot, I can honestly say that these amps rock ... and rock HARD!! I am excited now to share my own amp and sound and it is awesome!" 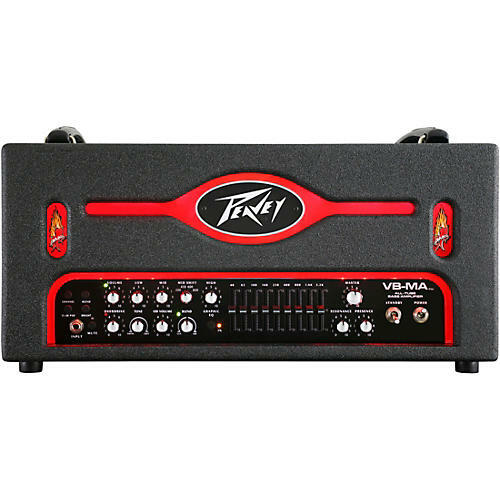 Similar to Peavey's popular VB-3 bass amplifier, the dual-channeled VB-MA is styled with a striking red backlit panel that features Michael Anthony's chili pepper logo. The VB-MA combines four 12AX7 and two 12AT7 preamp tubes with a matched octet of EL34 tubes that give players tons of characteristic pentode tube tone with uncharacteristically tight response for an all-tube amplifier. An innovative, and tour necessary world-compatible switch-mode power supply and advanced design provide stadium levels of explosive tonality. Peavey's patented Resonance and Presence controls adjust the damping factor at the low and high ends, respectively. The VB-MA features a three-way speaker impedance selector, to enable players to match the VB-MA to virtually any bass speaker enclosure. Resonance and Presence are also useful in dialing in power and response for particular styles, including "tight" sounds that are not normally associated with tube amplifiers. Includes footswitch. Play any gig with your sound and power to spare. Order today.